This past February, the CHSAA lost a basketball coaching legend when Tim Leary – who coached varsity boys’ hoops at St. Francis Prep, Fresh Meadows, for 43 seasons – died at the age of 73 after a nearly yearlong battle with gallbladder cancer. 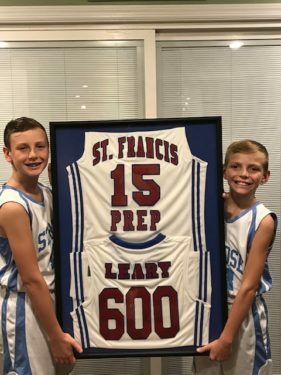 Though he’s no longer physically with us, Leary’s basketball legacy is being carried on in the Diocese of Brooklyn through his two grandsons: Aidan and Jack Leary. Aidan, 12, and Jack, 10, play Catholic Youth Organization (CYO) basketball at St. Rose of Lima, Rockaway Beach. Aidan is a seventh grader at Scholars’ Academy, Rockaway Park, and plays for St. Rose’s Rookie boys’ CYO team, while Jack is a fifth grader at P.S. 47, Broad Channel, and plays for St. Rose’s Bantam CYO boys’ team. Basketball has been in these boys’ blood since they were born. Their grandfather’s teams won a total of 646 games – the most for any St. Francis Prep coach, the seventh most among New York State basketball coaches and the second most in the CHSAA to the late Jack Curran of Archbishop Molloy H.S., Briarwood. But for Leary, it was never about winning. It was more about building character among his players through the sport of basketball – something he was very successful in doing during his tenure as a coach. That same message has trickled down to his grandsons. Aidan and Jack remember their grandfather taking them to his L’il Terriers high school practices the past few seasons. Aidan interacted with the high schoolers, who helped him with his shooting and passing. Jack meanwhile watched intently from the sidelines to see how he could improve his game. Leary’s son and the boys’ father Timothy is proud of his sons for following in their grandfather’s footsteps. He currently coaches Aidan’s CYO team and played himself for Our Lady Help of Christians, Midwood, and Bishop Ford H.S., Park Slope. Ironically enough, his Falcons varsity team defeated his father’s Prep team twice during his junior season at Bishop Ford. Again though, for Coach Leary, basketball was more than just winning. “My father coaching basketball was such a large part of our lives growing up that it’s in our fabric as a family,” Timothy said. “We spent so much of our lives around it. The boys just finished up a preseason hoops tournament. Aidan said he felt his grandfather out there with him, and Jack agreed, saying he especially thought about his grandpa each time he made a 3-pointer. These boys knew how much their grandfather loved basketball, so they’re taking it upon themselves to make sure Leary’s passion for the game continues to be celebrated. There’s no doubt that Leary taught his grandsons well – both on the court and as budding young men. And as the late coach now smiles down upon Aidan and Jack, he knows the family name is in good hands when it comes to the tradition of basketball.